If you’ve been wondering how to make mint tea, you’ve come to the right spot. Filled with the comforting aroma and refreshing taste of mint, these mint tea recipes are sure to delight. 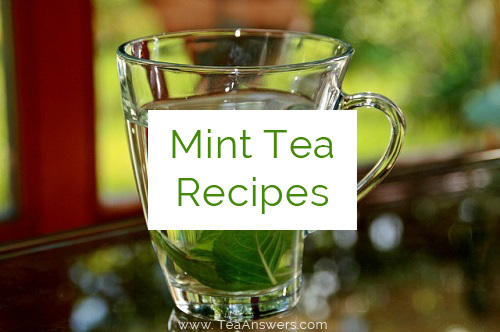 You’ll find mint tea recipes using fresh peppermint, iced mint tea, and Moroccan mint tea. Each mint tea recipe is simple to prepare, using ingredients you probably already have in your kitchen. Whether you’re craving a cup of mint tea to ease an upset stomach, soothe a headache, or relax after a long day, you’ll enjoy these recipes. This recipe reveals one of the easiest ways to make peppermint tea. It can be made with as little as 2 ingredients. It’ll taste like you’ve spent hours slaving in the kitchen, not mere minutes. Wash your peppermint leaves and pat them dry with a towel. Place the peppermint leaves in a teapot. Cover and let steep for 8-10 minutes. Strain and add sweetener, if using. Enjoy your fresh peppermint tea! We usually think of mint tea as a beverage for cooler weather. But mint tea is a great choice for an iced beverage on hot summer days! All mints – peppermint, spearmint, and more – are naturally cooling, and with their minty flavor, they’re a delicious, refreshing choice for iced tea. You can even add a squeeze of lime for an extra special treat! If you ever want to turn this iced mint tea recipe into a hot mint tea, simply reduce the amount of mint by half. If you’re using fresh mint, wash it and pat dry with a towel. Slightly crush the leaves with your hands, the bottom of a pan, the back of a spoon, or a mortar and pestle to bring out the aroma and oils. Add the dried mint, teabags, or fresh mint to your teapot. Cover and let steep for 5 minutes for dried mint and teabags, and 8-10 minutes for fresh mint. Strain the tea and allow to cool. Add your optional sweetener and lime juice. Pour the tea into a large glass of ice. Throughout Morocco, you will find hot, sweet mint tea. It’s traditionally made by steeping spearmint with gunpowder green tea. Moroccans do like their mint tea really sweet, but feel free to adjust the amount in this recipe to your liking. When pouring your tea, make sure to lift your teapot high above your cup. Moroccans appreciate how this aerates the tea and enhances the flavor. While it is always drank hot in Morocco, this mint tea recipe is also great iced. Less authentic, but equally satisfying. Place 1 cup of water in teapot to warm pot. Swirl and pour out water. Add remaining water and gunpowder green tea. While the tea is stepping, wash your mint leave and lightly crush them with your hands or a mortar and pestle to release their aroma and oils. This enhances the flavor and benefits of the mint. Add mint and sugar to the tea. Cover and let steep for 4 minutes. Serve and enjoy your Moroccan mint tea! I’d love to know your favorite mint tea recipe! Let me know in the comments below.